Our product range includes a wide range of burger wrap - ecowraps food wrapping paper, ecowraps burger wrap and laminated food grade paper bags. Stageman Press launches EcoWraps, a multi-purpose food grade paper ideal for wrapping your everyday meals like paranthas, rotis, burgers, sandwiches & many more such items. It is heat resistant upto 220 degree Celsius, non-sticky, certified for contact with food & keeps food fresher than aluminium foil due to its breathable material which optimizes the moisture content of your food. Now make your packed meals fun and keep it fresh by using Ecowraps Food Wrapping Paper, which comes in an attractive print so that your kids would never bring a full tiffin box back! Our product is recommended by Master Chefs across India. The product can be safely used in microwave ovens within this range. Eco Wrap your burger for lunch on the go. Build your Burger, fold in the cornersand wrap. Use as a placemat. This sustainable Burger wrap is perfect for grownups and kids! 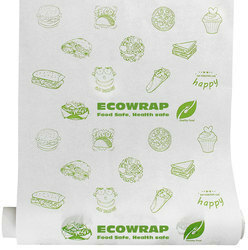 EcoWrap is the naturalalternative to plastic wrap for food storage. Reusable.Use the warmth of your hands to soften the wrap. When cool, the wrap will hold its shape. Wash inCOOL water with a mild dish soap. Let air dry. 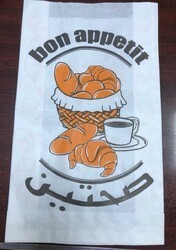 Looking for Food Wraping Paper ?